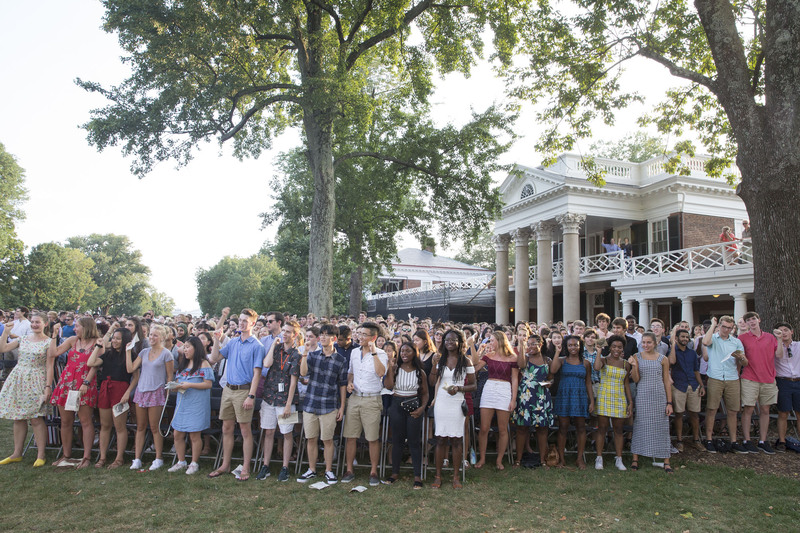 Like the 3,840 members of the University of Virginia’s Class of 2022, UVA President James E. Ryan is facing something entirely new and different this year. 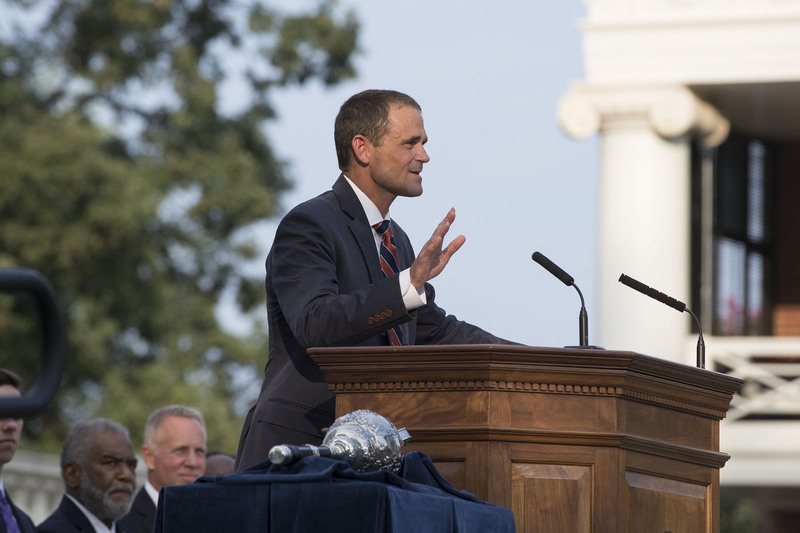 Ryan, who took office Aug. 1, addressed his largest student audience yet late Sunday afternoon when he spoke to UVA’s new first-year class during this year’s Opening Convocation and Honor Induction, which took place on the Lawn after a beautiful move-in weekend. He also addressed about 2,700 new graduate and professional students at an earlier convocation ceremony Sunday. “On behalf of the entire community here, I would like to welcome you to one of the finest universities in the world,” Ryan began as he looked out at the students filling the Lawn. Ryan focused his speech on the importance of building bridges, repeating one key refrain several times: “When in doubt, build a bridge.” He urged students to reach out to each other, to professors, to UVA employees and to the surrounding Charlottesville community. Already, some of those bridges were taking shape on the Lawn. Sunday marked the first time the entire first-year class was all in one place after the hustle and bustle of move-in weekend, which saw students hauling mini-fridges into their new dorms rooms in the morning and attending a T-Pain concert on Grounds on Saturday evening. Kim agreed, noting that their hall, in the Malone dorm, already felt close-knit. Both students were looking forward to hearing more from UVA’s new president. “I am excited to see what the new president has in store for UVA,” Garcia said. Sky Sload, Sheeba Prince and Catriona Corallo, who are all on the same hall in the Tuttle-Dunnington dorm, were happy to have their entire class in one place. “I am looking forward to hearing more about the honor code, everything that UVA has to offer and the great community that we are in,” said Sload, who is from Ashburn and hopes to major in leadership and public policy. During Opening Convocation, students are officially welcomed to the University, sign the honor pledge and get their first taste of many UVA traditions, from the first joyful rendition of “The Good Old Song” to hearing welcoming letters from the University’s secret societies. They also learn a bit more about each other. The Class of 2022 hails from all corners of Virginia (65 percent are in-state students) and around the world, with 43 states and 82 countries represented. The new graduate student class represents more than 400 different undergraduate institutions and 70 countries. Six hundred sixty-two of the students gathered on the Lawn Sunday evening were transfer students. About one in 10 are first-generation college students, as was Ryan himself when he attended Yale University. “I remember when I arrived on campus my freshman year, it was like landing on a different planet – one where I didn’t know the customs and didn’t feel like I fit in very well,” he said. 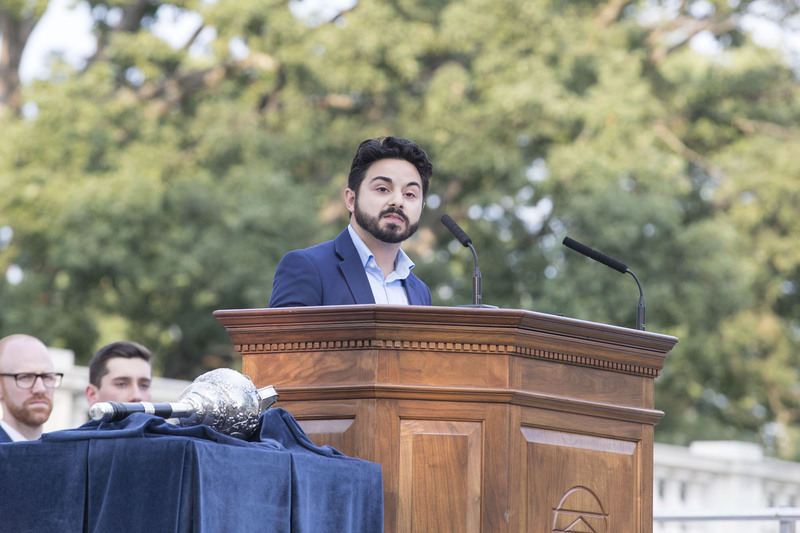 Student speakers, including Student Council President Alex Cintron, University Judiciary Committee Chair Kevin Warshaw and Honor Committee Chair Ory Streeter, echoed Ryan’s message and expanded on the value of student self-governance at UVA. 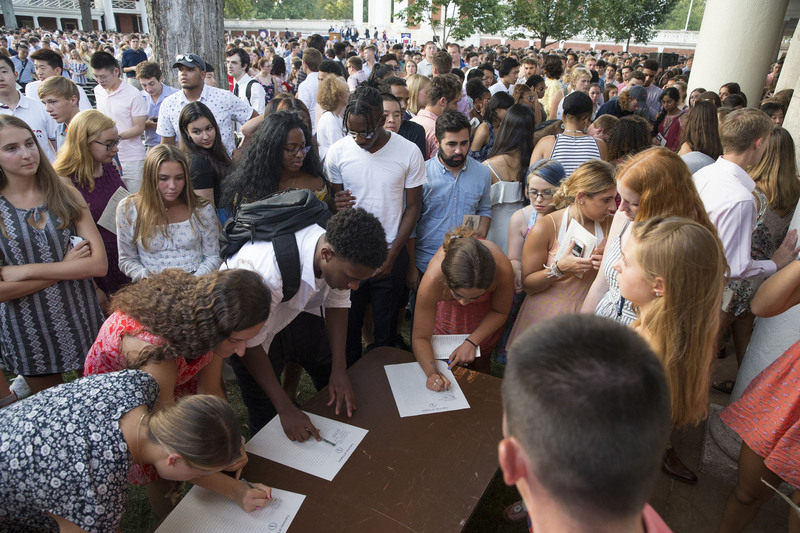 In addition to hearing from Ryan and student leaders, the newest Cavaliers learned about the history of the honor code and, as dusk deepened on the Lawn, signed the honor pledge not to lie, cheat or steal. “To me, the honor code reaffirms the positive things about UVA, the community it is built on and the feeling of honor and trust,” Kim said. Streeter, the honor committee chair and a graduate student in the School of Medicine, encouraged students to think of the honor code not just as a legacy of the past – it has been a fixture at UVA for more than 175 years – but also as something they must build for the future. After Streeter’s introductory remarks, keynote speaker Vivian Pinn took the stage. 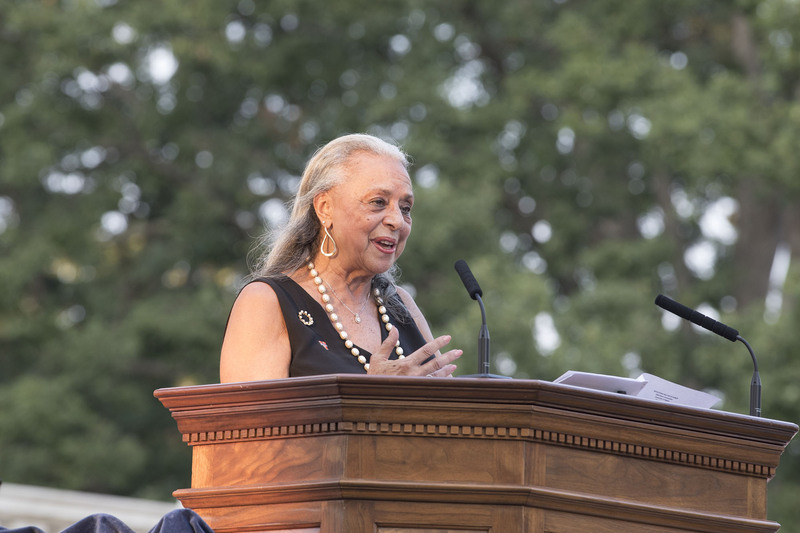 Pinn graduated from UVA’s School of Medicine in 1967, the only woman and the only African-American in her class, and went onto become the first director of the Office of Research on Women’s Health at the National Institutes of Health. Pinn Hall, a medical research building on Grounds, was renamed in her honor in 2017. In discussing what the honor code meant to her at UVA, Pinn recalled one of her first moments on Grounds, waiting in the back of an auditorium for class to begin and wondering if she really did belong here. “I felt very alone and very different,” she said. “Then, two classmates who I had never met reached out to me and invited me to join their anatomy lab group. It was a gesture of reassurance, that perhaps I could belong at UVA, that perhaps these guys would help me to do so. She told students that the basic principles of the honor code would apply for the rest of their lives, no matter what path they chose. “The honor code implies more than just exams; it is about how relate to each other. In today’s world, not much can be more important than that,” she said. 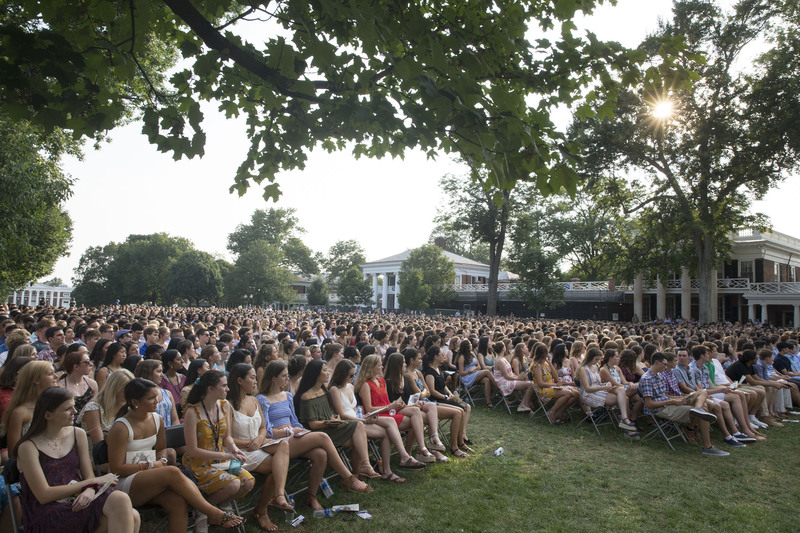 Indeed, the next time the full Class of 2022 will gather on the Lawn – as Ryan and others reminded the students in their remarks – will be at their own graduation in four years.